If climbing up to sheer cliffs overlooking one of the most magnificent bays in the world sounds like your kind of buzz then you might want to check out Spider Monkey Climbing on Phi Phi Island. Climbing truly frees the spirit and connects you to nature like no other pastime and Phi Phi has some of the most magical jungle cliffs and sandy bays to experience the beauty. Spider Monkey Climbing finds itself at the heart of some of the best climbing routes in South East Asia. The perfect and clean limestone cliffs of Phi Phi Ley and Phi Phi Don are a climbers paradise (however you cannot climb on Phi Phi Ley as no routes have been re bolted but it's fantastic for bouldering). These well bolted routes are ideal for beginners up to advanced. As Phi Phi Island is not as busy for climbers as Railay Beach in Krabi, these cliffs are a great place to learn and/or find a bit of peace and quiet on the remote and isolated cliffs. Phi Phi's climbing big brother, Railay Beach, has more routes but some of the more well used routes can be polished and you may have to queue to use them. The Three Day Course aims to improve technique on some of the more interesting routes available on Phi Phi Island. The personal instructor gives 1 to 1, or maximum 1-2 time teaching the customer belay technique, safety techniques, how to lead climb, and where capable, introduction to multi-pitch. The specific Multiple Pitch Course can either get the climbers up four pitches to the top of Tonsai Tower, a vast and sheer wall about 100 meters high at the end of the beautiful Tonsai beach, or teach the safety techniques and give a day's practice at various two pitch climbs. If that isn’t a blast then nothing is! Spider Monkey Climbing rents out equipment to experienced climbers. A full set for 2 people for the day is 1,200 THB (2009). This would include Harnesses, Shoes, 12 Quickdraws, Belay device, Rope, safety sling and locking carabiner, chalk bag and helmet. All equipment is regularly checked and washed with fresh water, without detergent and ropes are not used for more than one year. Finally Spider Monkey Climbing also run a Full Day Tour with a morning half day climb and then a half day trip to Phi Phi Ley, including optional cliff jumping and shark watching, visiting monkey beach and Maya bay. Spider Monkey Climbing is one of Thailand’s equipment sellers and stocks Mammut as well as Black Diamond, Petzl, 5.10, Sportiva, DMM etc. On a comparison with other climbing equipment suppliers, Spider Monkey Climbing has some of the cheapest in all Thailand. Spider Monkey Climbing use brand new ropes, mostly Beal and will use them for a maximum one year. Equipment is regularly check for any signs of deterioration. Spider Monkey Climbing contribute towards the re-bolting and the upkeep of the cliff. 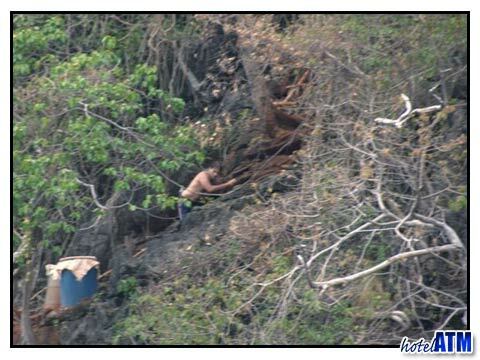 In turn they financially contribute to Magnus Wiklund and Shamick who have been re-bolting the Phi Phi cliffs and putting up new routes for years. Dry season is Nov – March but can be very hot. Cooler season is May Oct, any showers dry off quickly. Spider Monkey Climbing has a no feeding the monkeys policy as the monkeys can become aggressive. 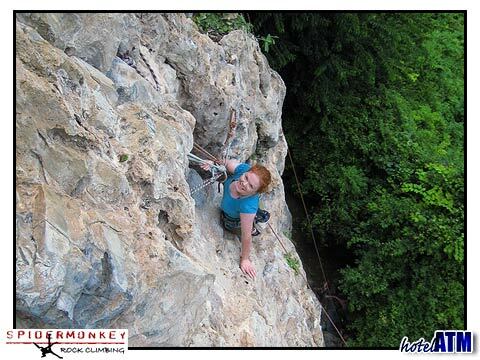 Spidermonkey Rock Climbing offers climbing for everyone with safe and experienced guides. Spidermonkey Travel arranges accommodation, tours, travel and flights throughout Thailand.